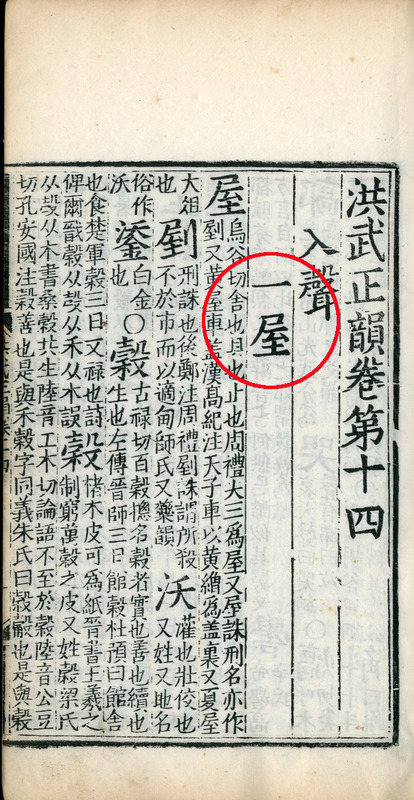 In several places elsewhere in this blog I have explained the nature of Chinese encyclopaedias and their importance as a source of lost texts. 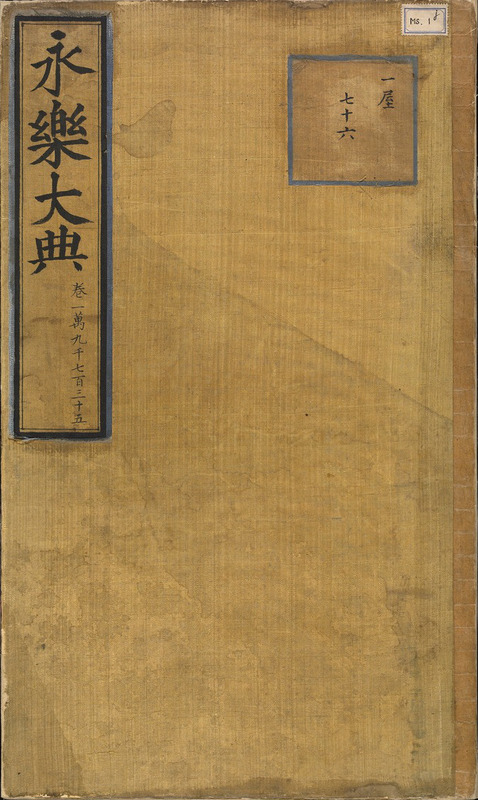 It is well known that when Siku quanshu 四庫全書 was being compiled during the Qianlong period, 385 of the works it contained (more than ten per cent of the total) which were otherwise lost were reconstituted from quotations in Yongle dadian. Less well known is the precise manner in which this was done. 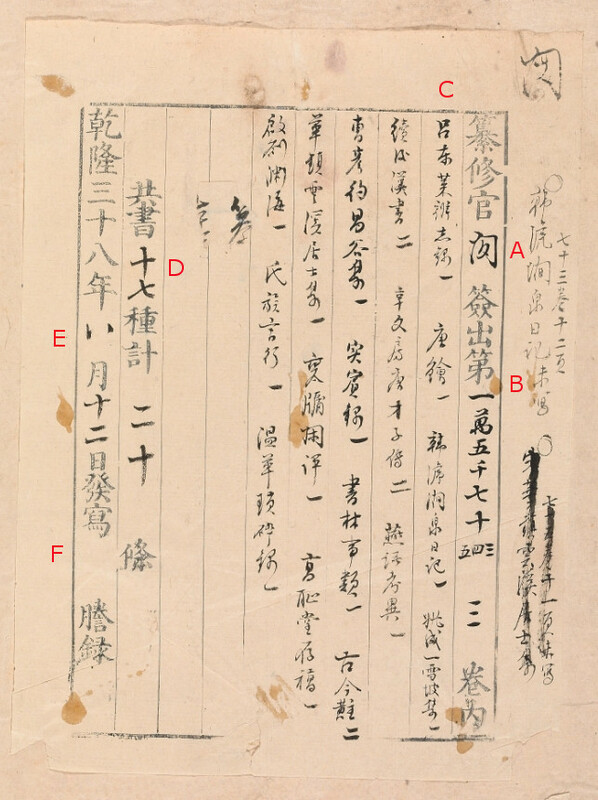 These forms are extremely valuable pieces of ephemera, as they give us a glimpse of the working practices of the editors which would otherwise be completely unrecorded – Chinese scholars of that period (if not all scholars of all periods) are not known for their interest in the practical and mundane. 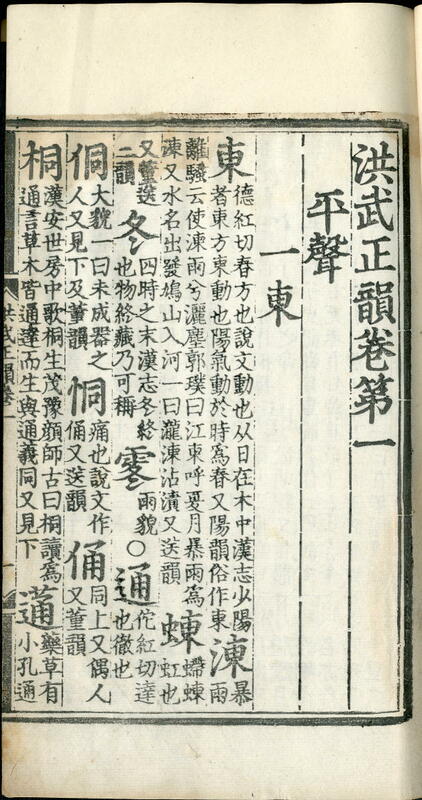 For this reason, when examining and taking stock of the volumes of Yongle dadian in European libraries, I made a careful note of the existence or otherwise of these forms, which can be summarised as follows: of the total 59 volumes, forms are present in 12, there are traces of forms in 16, and there is no evidence of forms in 31. And so in the tiny sample that the European corpus represents (scarcely 0.5% of the total), forms, or evidence of them, are present in less than half. Not only is this sample too small to be scientific, but we don’t know whether the volumes lacking forms ever had them, or whether they might have disappeared if the volumes were ever repaired or rebound. At first I thought that no work could have been done on these forms, because access to original volumes of Yongle dadian is limited, and the Zhonghua Shuju reprint of 1960/1984 (cited in my paper on the European holdings) is somewhat sanitised, reproducing only the text itself and not the covers and associated material. So in spite of the inadequacy of the European sample, I thought the path was open either to me to make a second original contibution to sinology, or to a bright student to make it the subject of a dissertation. But yesterday, my hopes were dashed when after a little searching in CNKI’s online database Chinese Academic Journals, I discovered an article on this very topic by Zhang Sheng 张升, a professor of Ming and Qing history and literature at Peking Normal University with a particular interest in Siku quanshu studies (《四库》馆签佚书单考, in 中国典籍与文化, 2006:3, 61-66). 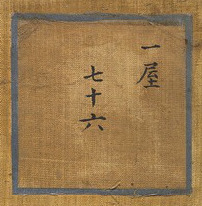 Zhang Sheng first explains the structure of the forms. This is mostly self-evident, and I will illustrate it in a moment from one of the forms in the Bodleian volumes. He then uses the forms to investigate the identity of the thirty scholars who are known to have worked on extracting the lost passages from each volume. He has been able to identify twenty of the thirty names from the labels he has seen (mostly in China and Japan), together with the range of juan he reckons each of them worked on. Strangely, he gathers evidence from one of the forms preserved in a volume in the Bodleian (juan 5244-5245), but does not mention those in the other two volumes (juan 15073-15075 and 16217-16218) which would have filled a large gap in his list and enabled the names Min 閔 and Chen 陳 (from Guangdong 廣東) to be added; nor does he consider the volumes in the United States and elsewhere in Europe. Next he examines the process of the extraction itself, and finally determines the precise time when this took place. In all these four areas of enquiry, the forms are the primary if not the only source. 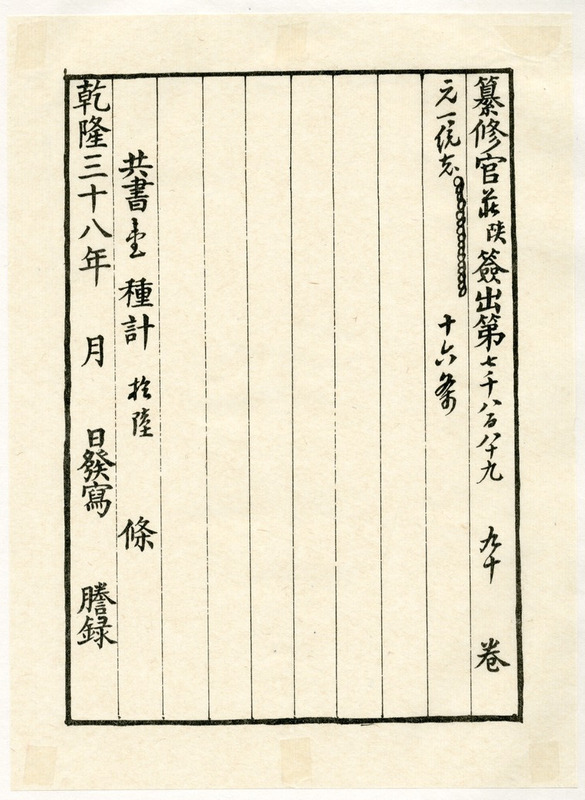 All the forms were printed from the same block, dated the 38th year of Qianlong (1773) – only the month and and day were to be completed in manuscript (E). We thus know precisely when the work was done. For some reason not yet explained, the name of the person who was to do the copying (F) has not been entered in any of the surviving forms. 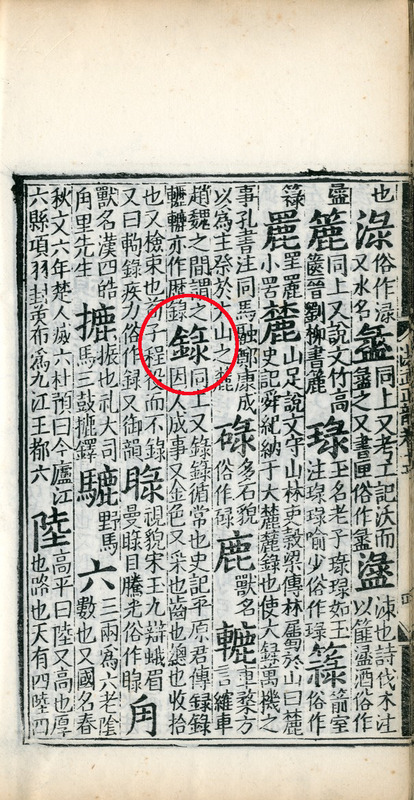 So from the example shown, we learn that an editor called Min worked on juan 15073-15075 on the 12th day of the 8th moon of the 39th year of Qianlong (27 September 1773), and identified twenty passages to copied from that volume, taken from seventeen different texts. Here, the titles of the texts are listed in the normal way, but each passage copied from them is indicated by a circle, not the total number; the editor must have been drawing the circles as he went through the volume, so as not to lose count. And so we get a very close look at the actual working practice of the editors, and see that they did the job in exactly the same way as we would do it today. 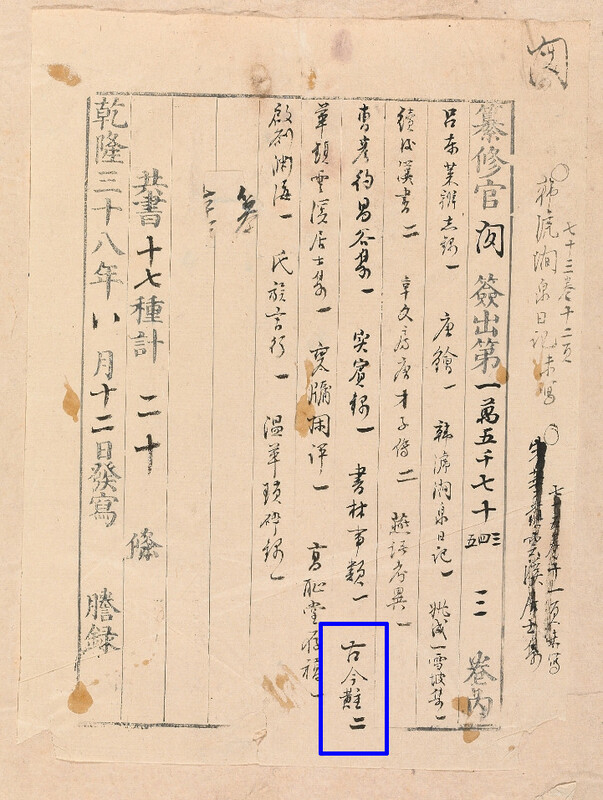 Another interesting piece of evidence is found in juan 13872-13873, a volume also in the Bodleian, where we have the remains of a printed form together with a manuscript slip bearing the words 「此本無簽」 “this volume has no label”. This must mean rather more than what is obvious, but what, I wonder? I have no idea how or on what basis the many fragments of text were assembled to reconstitute the complete work, that is, in what order they were fitted together, and how the juan divisions were decided. I still feel a sense of excitement when looking at these original volumes of Yongle dadian, seeing the very manuscript from which lost texts were reconstituted, and the evidence of the precise manner in which this was done. Whether these volumes are appropriately located is a different matter, and I’ll be looking into this presently. My only original contribution to sinology is to discover a hitherto unrecorded volume of the well-known Chinese encyclopaedia Yongle dadian 永樂大典. The discovery took place in April 1997 during the course of a conference held at the University of Aberdeen to mark the centenary of the death of James Legge, a missionary to China from the nearby town of Huntley who subsequently became a pioneering sinologist and first Professor of Chinese at the University of Oxford. At a soirée in the University Library in connection with this event, I asked Myrtle Anderson-Smith if the special collections, of which she was currently in charge, contained any Chinese books. She could only recall a large fascicle covered in yellow silk, with the text in black and red. It could only have been a fascicle of Yongle dadian, and an examination of it the following day confirmed that this was indeed the case – the unusually large size of Yongle dadian‘s fascicles, in addition to the unique binding and distinctive presentation of the text, make an impression that is relatively easy to recall. Easy, that is, if you’ve ever seen or handled them. Thereafter, I came to be regarded as something of a specialist in Yongle dadian studies, and was asked to present an account of the British holdings of this work at a conference in Peking in 2002 to mark the 600th anniversary of the start of its compilation. For my presentation there, I gathered as much information as I could about the circumstances under which the surviving fascicles of Yongle dadian were scattered in the aftermath of the Siege of the Legations in the summer of 1900, carefully recording the precise provenance of every single fascicle. I subsequently expanded this paper to include all the fascicles of Yongle dadian in European libraries, completing the account only in October when I visited Dublin to see the three fascicles in the Chester Beatty Library. My work is rather turgid, and consists largely of footnotes and a detailed table. The text itself is essentially the talk that I gave at the conference in Peking. It can be seen here. Later, I was invited to give a talk about the Aberdeen fascicle at a meeting of the University’s Chinese Studies Group in March 2009, and took the opportunity of recording my understanding of what Chinese encyclopaedias are, and how the Yongle Dadian fits into the scheme of things. The text of that talk can be seen here. Most recently, I have refashioned my work for the current issue of Arts of Asia (44:6, 2014, 82-89) in a series of articles commissioned to coincide with the British Museum’s Ming exhibition, where a fascicle of Yongle dadian from the British Library’s collection is on show. Very few people have even seen any of the surviving parts, let alone handled them. This is because we are dealing with a work that was never printed, and whose surviving parts are held by only a few libraries. The National Library of China holds most, but even when visiting that library as a representative of the great Bodleian Library in Oxford, I would not ask to handle them. It would be like a Chinese colleague coming to the Bodleian and asking us to produce a Gutenberg Bible or a First Folio. In any case, a number of very faithful facsimiles give a good idea of what the original volumes feel like. 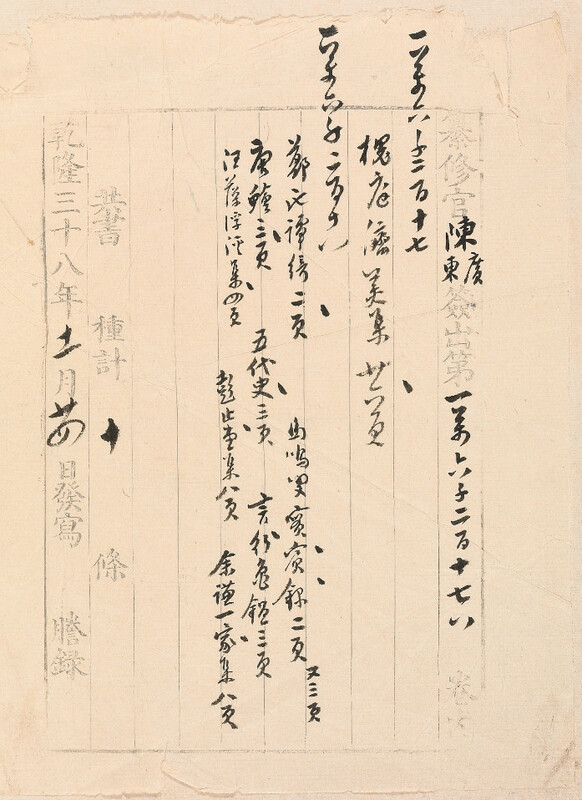 The scholarly content of Yongle dadian has been thoroughly exhausted, starting in 1773 with its use as a source for reconstructing lost works for the Siku Quanshu 四庫全書 project (and I can still remember the frosty reception that one of the participants got when he said as much at the Peking conference in 2002; rather like the reception that A.B. got at the hagiographical Legge conference in Aberdeen, when she said that the great man’s understanding of Chinese mythology was virtually nil). The cover has been repaired, but both the labels have been retained. In some cases one or both these labels have disappeared. The label on the left is quite straightforward, giving the title of the work and the juan contained in that volume. In this case there is only one, but most of the surviving fascicles contain two or three. The juan are numbered consecutively throughout the work, giving no indication of their content. This is provided by the small label on the right. Before the compilation of Yongle dadian, the biggest works ever produced in China were the Taiping yulan 太平御覽 (1000 juan, and completed in 983) and the Cefu yuangui 冊府元龜 (also 1000 juan, and completed in 1013); these were two of the so-called “Four great books of the Song Dynasty” 宋四大書 (the other two being the Taiping guangji 太平廣記 and Wenyuan yinghua 文苑英華, completed in 981 and 982 respectively). All these works had been arranged by subject. But Yongle dadian was more than twenty times bigger than the biggest of these “Four great books”, and it is recorded in the Ming Shilu that the emperor himself had required that the entries be arranged by rhyme, so that locating them would be “as easy as taking things out of a bag” 便如探囊取物 (明太宗文皇帝實錄, 20, 132). 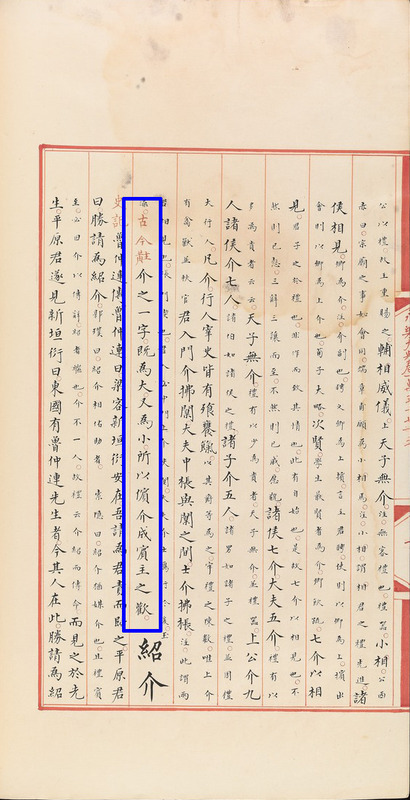 So far as I know, this is the first time that the entries in a Chinese encyclopaedia were arranged not by subject, which is inevitably arbitrary to some extent, but in the fixed order of a commonly accepted sequence of characters – the Chinese equivalent of our alphabetical order. 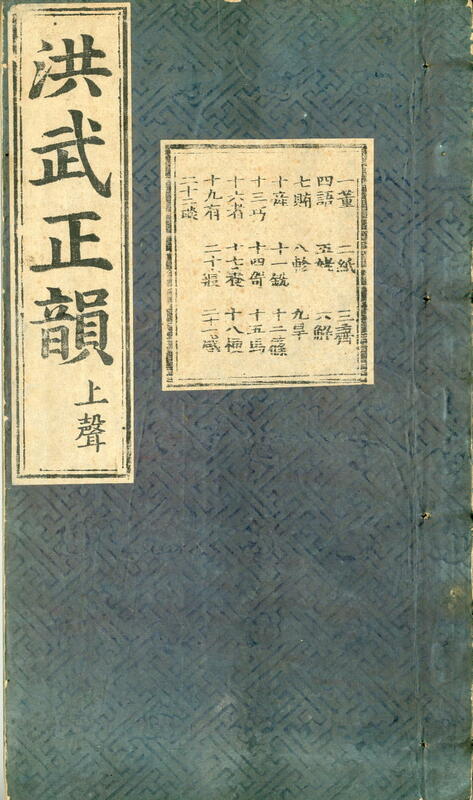 The rhyming sequence adopted was the one that had been used in a fairly recently compiled work that for a time became standard, the Hongwu zhengyun 洪武正韻, or “Correct rhymes of the Hongwu period”. 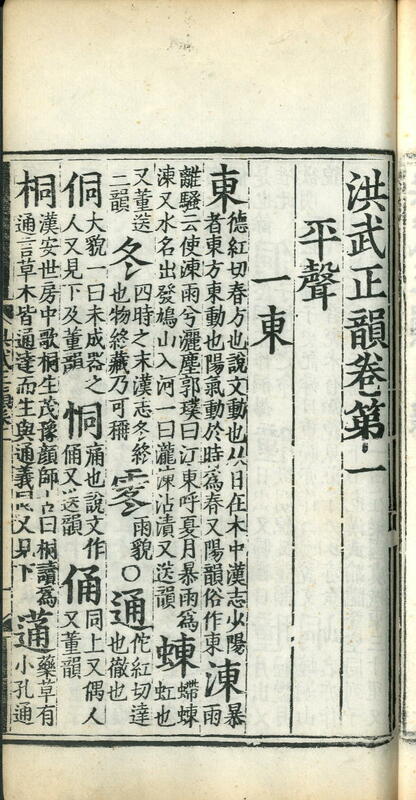 This had been compiled in 1375 at the behest of the first Ming emperor, and was an attempt to establish the northern pronunciation of Mandarin as standard, but it actually reflects the southern Mandarin speech of its compilers. We have two Ming editions of this work in our collections, which I will take the opportunity of presenting. It is clear from these specimen pages that both editions belong to the same family, being identical in format. 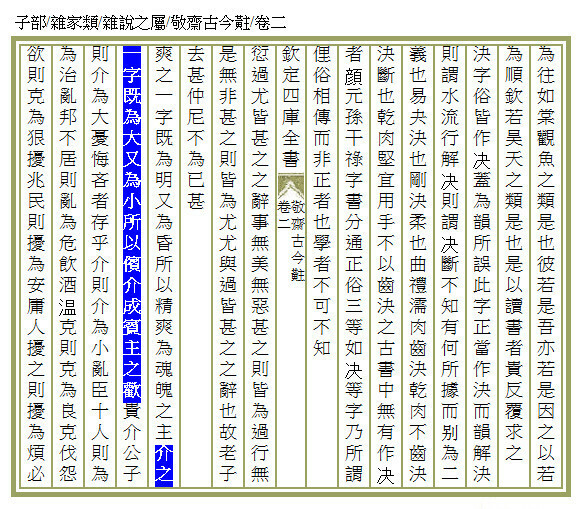 Like all the editions curently represented in the CALIS database with the exception of a single edition from the very end of the dynasty (明崇禎四年), they must surely be copied from the first edition which was presumably an imperial edition made in the early Ming, although I have failed to find an edition so described in any catalogue. Returning to the fascicle of Yongle dadian illustrated above, we see that the label indicates that the volume is the 76th (of a total 251) in the rhymes under the character wu 屋, the first character in the former fourth, or “entering” tone 入聲. The table of contents of Yongle dadian, if there ever was one, has long ceased to exist. 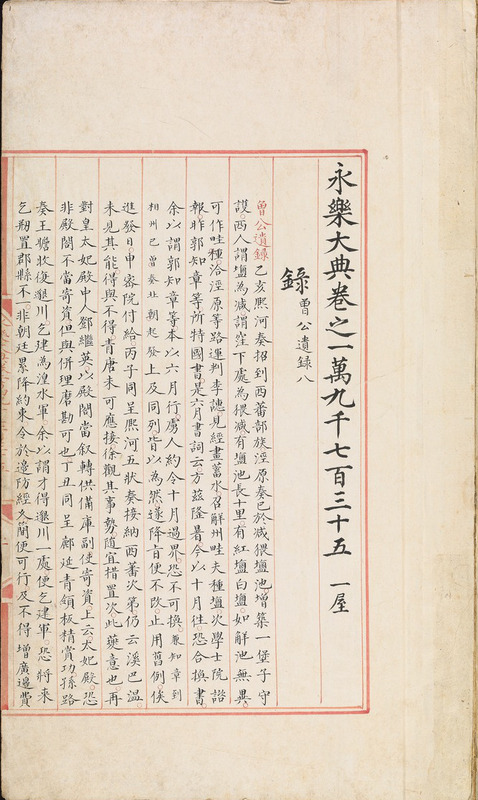 But in 1932, in the bulletin of the National Library of Peiping as it was then called, Yuan Tongli 袁同禮 reproduced a manuscript table of contents of the encyclopaedia that had recently come into the library’s possession, bearing the seal of the Hanlin Academy 翰林院, where the encyclopaedia was formerly housed (永樂大典存目, in 國立北平圖書館館刊 6:1, 1932, 93-133). Yuan Tongli (1895-1965), a graduate of Peking University who went on to become a distinguished librarian, was fascinated with Yongle dadian, and made great efforts to establish the whereabouts of extant volumes, as noted in my paper on the European holdings referred to above.